A New England autumnal tradition is underway in Carver, MA. The same people that make fun of D&D, LARPERS, and that Ren Faire episode of The Family Guy are the same people making that secret, sacred pilgrimage to King Richard’s Faire each year for the poppy recreation of 16th century England. Yay though there is mead, wine, cheesy fries, axe throwing and the definitive turkey leg, there is plenty of fun for the whole family there. Along with an archer, a sorceress and a warrior princess, I headed to King Richard’s Faire this year to see what the kids had to offer at the Prince and Princess Costume contest this past Saturday. Each weekend at the faire boasts a special event or contest for the Lords and Ladies of the day. Upcoming special events include an epic beard & mustache competition, an adult costume contest, and another children’s costume contest for the best looking Fairies & Pirates in the land. The Faire is only open for a few more weekends, until October 20th, so if you are in New England start packing those leather pouches and chain mail masks into the car for the road trip. Volunteer judge Amy DellaPosta from the Cape Cod Mommies Blog was joined by Ashley Bunker of Memoirs of a Modern Day Wife alongside Snow White, King Richard, and a court of servants on the King’s Stage to judge and help out our prince and princesses. Preregistration for costume contests is not required, so a line of Mommies and Daddies got their kids in procession. Each kid showed off their costume in style, getting a booming introduction over the P.A., even if they were to shy or young to want the attention. Each princess donned beautiful dresses and hair, while the boys had a stiff upper lip, swords and bows in hand as noble knights, pages and thieves. Snow White directed traffic on stage, as the princesses dominated stage left and the few boys took up a tiny corner on stage right with the King. The judges had their work cut out for them, choosing finalists from such a fine crop of lads and lasses could not have been easy. Snow White herself seemed only nervous in two separate moments on stage—when she saw a tiny version of herself approach the King and a second time when a wee Wicked Queen infiltrated the contest, red apple in hand! In all, a fine time was had by all, and save for one or two tears after the judgment, the kids enjoyed being on stage in full regalia, forgetting for that time that there was a contest to be won. A pre-Halloween excuse to dress up is always welcome, and a dress rehearsal for the big night. In the end, young miss Alexandra beat out the other princesses for the win, and our super cool, thumbs up leading man Tristan in his adorable silver knight costume won for the boys. Prizes included an honorable photo opportunity with King Richard himself, a sword & shield set to Tristan to protect the King from outside forces. Of course Alexandra had the most exquisite tiara in the land as her prize as the King’s favorite princess during the crowning. Quite a time was had at the King Richard’s Faire this weekend, and the kids looked great. Congrats to the young winners Tristan and Alexandra, enjoy your reign! Win Passes For King Richard's Faire! FOG! Visits KING RICHARD'S FAIRE! Huzzah! 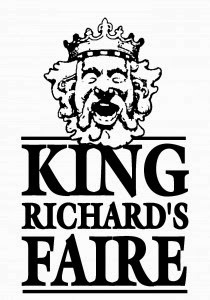 Win Passes For King Richard's Faire!